Ptolemy V -- 196 B.C. whereas after enquiry he has been renewing the most honorable of the temples during his reign, as is becoming; in requital of which things the gods have given him health, victory and power, and all other good things, and he and his children shall retain the kingship for all time. it was further decreed that a festival shall be kept in the temples throughout Egypt on these days in every month, on which there shall be sacrifices and libations and all the ceremonies customary at the other festivals and the offerings shall be given to the priests who serve in the temples. And a festival shall be kept for King PTOLEMY, THE EVER-LIVING, THE BELOVED OF PTAH, THE GOD EPIPHANES EUCHARISTOS, yearly in the temples throughout the land from the 1st of Thoth for five days, in which they shall wear garlands and perform sacrifices and libations and the other usual honors, and the priests in each temple shall be called priests of the GOD EPIPHANES EUCHARISTOS in addition to the names of the other gods whom they serve; and his priesthood shall be entered upon all formal documents and engraved upon the rings which they wear; and private individuals shall also be allowed to keep the festival and set up the aforementioned shrine and have it in their homes; performing the aforementioned celebrations yearly, in order that it may be known to all that the men of Egypt magnify and honor the GOD EPIPHANES EUCHARISTOS the king, according to the law. Rosetta Stone discovered in 1799. This led to the decipherment of Egyptian hieroglyphics. 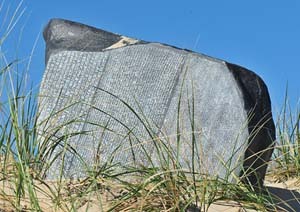 Merneptah's Stele. First mention of "Israel" in Egyptian texts. Stele dates to about 1210 BC. Amarna Letters (14th century BC). Letters written from Canaanite scribes in Akkadian to king Akhenaten about the conditions in Canaan, especially the troublesome Hapiru which probably refers to the Hebrews. Inscriptions at Karnak. Karnak is the largest temple complex in the world. There also may be the earliest depiction of the Israelites. Mortuary Temple of Rameses III at Medinet Habu. It depicts the battle with the Sea People. One of the five groups of Sea Peoples was the Philistines. There are carvings of what the Philistines looked like. Tale of Two brothers. This story is similar to the story of Joseph in Genesis when he is tempted. Seven Lean Years Tradition in the time of Djoser. Similar to the seven years of lean in the story of Joseph. Sinuhe's Story. Tells of his time in Canaan. Wenamun's Journey. Tells of his trip to Byblos in Canaan. Amenemope's Wisdom. Similar to Proverbs 22:17-24:22. Hymn to Aten which parallels Psalm 104. Elephantine Papyri. Letters from Jewish exile. --140-MinuteVideo: "A White Man's Journey Into Black History"